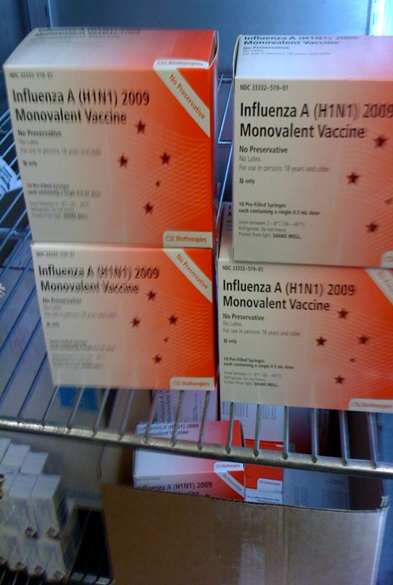 Rapid roll out of H1N1 influenza vaccine helped Massachusetts immunize 6.4 million residents. Facing the threat of a "swine flu" or H1N1 pandemic in the summer of 2009, the Massachusetts Department of Public Health (MDPH) acted quickly to ensure that those at the greatest risk would be vaccinated in a timely manner. JSI was contracted to assist in the development and implementation of an electronic system to register, prioritize, and monitor thousands of hospitals, community health centers, doctors' offices, and other prospective vaccination sites throughout Massachusetts before the first shipments of vaccine arrived in October. The problem was highly complex: four different solutions of the H1N1 vaccine, formulated for different populations, needed to be efficiently distributed to thousands of sites on a continuing basis throughout the fall and winter months in a climate of anticipation and anxiety. In addition, unlike most other states, MDPH did not have a web-based system for tracking immunization administration and managing vaccine distribution. Finally, since pregnant women and children were to be among the first vaccinated, the public health department needed to register many sites that did not typically offer immunization services, such as ob-gyn offices and elementary schools. H1N1 supplies ready and waiting to be distributed. JSI worked closely with the MDPH to build and test an online registration process to identify vaccination sites and the number of high-risk patients at each site. With the web-based system in place, JSI’s team registered 4,481 sites, including local health departments, pediatricians, ob-gyn offices, pharmacies, schools, and correctional facilities. Within weeks of start-up, JSI hired and trained eight people to work with MDPH personnel on the vaccination program. The staff answered health provider questions about registration, allocation of the vaccine, and reporting of vaccine use. The staff tracked vaccine shipments and depletion of vaccine stocks and looked for gaps in availability, and redistributed vaccine to meet the changing needs of sites. Additionally, JSI helped the MDPH vaccine program assist sites with special cases, including projections. The Centers for Disease Control and Prevention (CDC), the federal agency in charge of H1N1 distribution, allocated a total of 3.3 million doses to Massachusetts. This was enough to vaccinate more than half of the state's 6.4 million people over the course of the autumn and winter months. In the final analysis, Massachusetts was ranked second in the nation for successful H1N1 vaccination coverage of the state population. As the H1N1 pandemic came to a close, the state moved forward with developing a web-based electronic immunization information system. JSI’s successful roll-out of the H1N1 process demonstrated to resistant skeptics in the Massachusetts’ immunization community that an immunization registry would be a valuable tool to enhance vaccine administration and management. JSI continues to provide testing, roll-out, and implementation of the Massachusetts Immunization Information System (MIIS) to medical providers across the state, helping move the Massachusetts Department of Public Health forward in the field of immunization.